H-E-B’s True Texas Boil House offers grab-and-go baskets and combos of shrimp, crawfish and crab legs. Supermarket chains H-E-B and Hy-Vee continue to expand their presence in the restaurant arena. San Antonio-based H-E-B launched its 12th restaurant concept with the opening of seafood venue True Texas Boil House in Houston on Jan. 25. And earlier this week, West Des Moines, Iowa-based Hy-Vee announced plans to open a new Wahlburgers casual restaurant and bar early this summer in Wisconsin, the burger franchise’s first location in the state and Hy-Vee’s fourth Wahlburger’s location. H-E-B’s True Texas Boil House is located on the front patio of its supermarket at 10100 Beechnut St. in Houston. The 625-square-foot eatery offers grab-and-go baskets and combos of shrimp, crawfish and crab legs, which are boiled and sold by the pound. The menu also features fried catfish and shrimp; side dishes such as Cajun fries, hush puppies, coleslaw and seasoned corn and potatoes; and a range of dipping sauces. Customers can take their seafood home or eat it at outdoor tables in front of the restaurant, which is open from 3 p.m. to 9 p.m. on Mondays and from 11 a.m. to 9 p.m. on Friday through Sunday. H-E-B picked Houston for the first True Texas Boil House location because of the grocer’s popular parking-lot crawfish boils, Chavel Melchor, perishable leader at the Beechnut H-E-B store, told the Houston Chronicle. In June, H-E-B kicked off another new restaurant concept, True Texas Tacos, inside a new 9,000-square-foot convenience store in San Antonio. The taco shop features a menu of over a dozen freshly made breakfast and specialty tacos. Also in the store is H-E-B’s 10th South Flo Pizza outlet, which offers made-to-order pizza to go for $10. Other restaurant and food-to-go concepts launched by H-E-B include 3 Double-O Nine Restaurant & Bar, Café Mueller by H‑E‑B, Oaks Crossing Restaurant & Bar, Table 620 Dining & Drinks, Yumai Sushi & Noodle Bar, Café at H‑E‑B, Café on the Run, Flaming Bird, Stackers Handmade Sandwiches and True Texas BBQ. Meanwhile, Hy-Vee’s new Wahlburgers restaurant is slated to be located at The Corners of Brookfield shopping center in Brookfield, Wis. The 6,000-square-foot restaurant will offer signature burgers; made-from-scratch recipes; homestyle dishes; fish, chicken and vegetarian options; and a full bar, including specialty drinks such as adult frappes and floats. Hy-Vee in 2017 unveiled plans to build, own and operate 26 Wahlburgers restaurants. Its first three Wahlburgers opened last year at Mall of America in Bloomington, Minn.; West Des Moines; and Olathe, Kansas. The Midwestern grocers also sells Wahlburgers-branded menu items at its full-service Hy-Vee Market Grille restaurants in the Des Moines area. 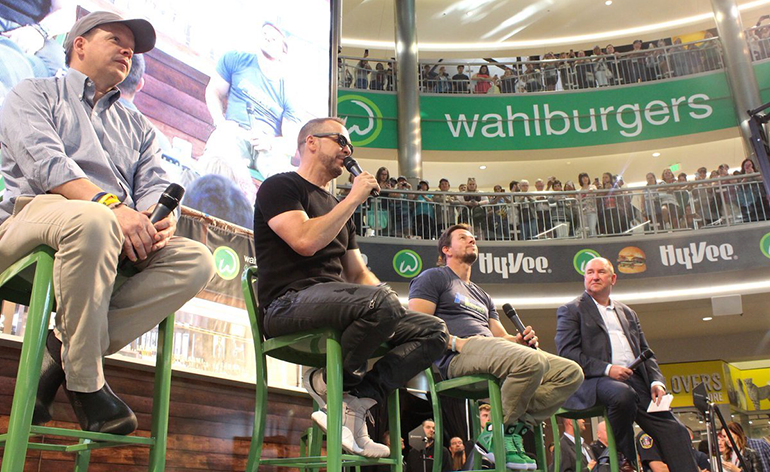 Donnie, Paul and Mark Wahlberg with Hy-Vee CEO Randy Edeker at the grand opening of the Wahlburgers restaurant at Mall of America. Hingham, Mass.-based Wahlburgers operates 29 restaurants in 19 states and Canada. Chef Paul Wahlberg launched the franchise with his celebrity brothers Mark and Donnie Wahlberg in 2011.